In August we experienced a partial solar eclipse in Providence. Next up (astronomically speaking), on Jan. 31, 2018 a partial lunar eclipse will be visible, weather permitting. Unlike a solar eclipse, where you need to have special eye protection, all you need to do is to gaze into the western pre-dawn sky to see the partial lunar eclipse. 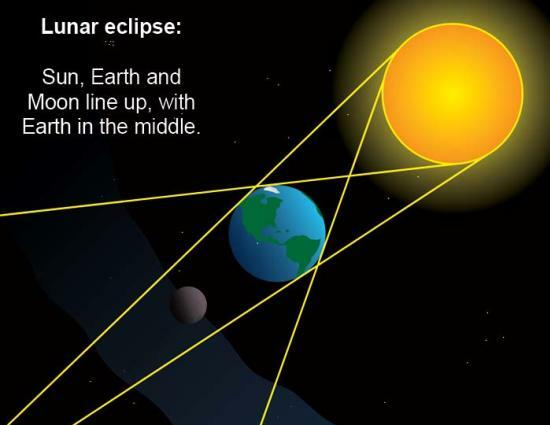 In Providence, the lunar eclipse starts at 6:48 a.m., with the maximum occurring at 6:53 a.m. It will only be visible for a few minutes before the moon sets at 6:56 a.m. Make sure you have a clear view of the western horizon. Lunar eclipses are not a rare phenomenon, however, the upcoming super blue moon eclipse is — the last one occurred 150 years ago. This lunar eclipse is rare because it involves the second full moon of the month, called a blue moon. On Jan. 31 the full moon is referred to as a supermoon because the moon is at its closest point of orbit, perigee. How much bigger will the full moon look? About 14 percent larger. Experience the super blue moon, and be sure to look closely at the western horizon before sunrise on Jan. 31 for your chance to see the partial lunar eclipse. Curious about the night sky? Check out a planetarium show at the Museum of Natural History in Providence. What Is a Lunar Eclipse? The moon moves in an orbit around Earth, and at the same time, Earth orbits the sun. Sometimes Earth moves between the sun and the moon. When this happens, Earth blocks the sunlight that is normally reflected by the moon. This sunlight is what causes the moon to shine. Instead of light hitting the moon’s surface, Earth&apos;s shadow falls on it. This is an eclipse of the moon — a lunar eclipse. A lunar eclipse can occur only when the moon is full. Renee Gamba is the director of the Museum of Natural History and Cormack Planetarium and outreach coordinator/teacher for the Krupowicz Planetarium. She manages all museum operations and leads education programs at both facilities. Her love for the sciences and space exploration continues in her free time, as a NASA Solar System Ambassador for RI. When she isn't doing that, she enjoys spending time with family, friends and her three dogs. In her spare time, she enjoys exploring the outdoors, birding, hiking, biking and kayaking.